A channel partner portal software is designed to provide a centralized platform to assist vendors in managing, overseeing, and calculating channel activities, as well as help partners, increase productivity and revenue. 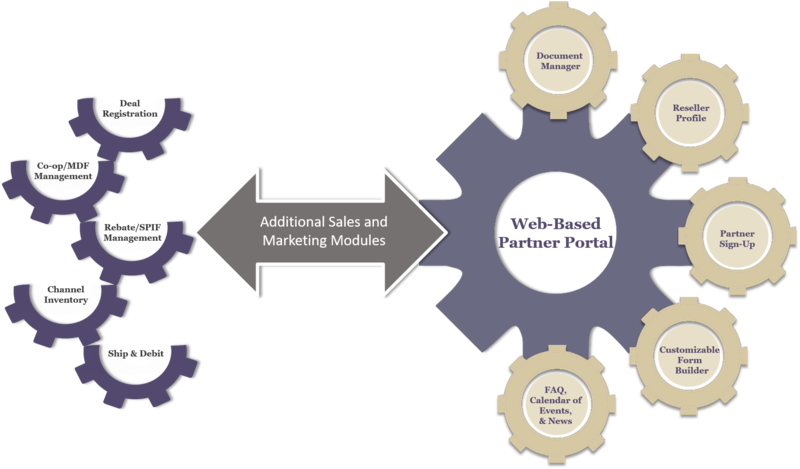 Partner Portals are used by vendors and their partners as an online hub for all of the vendor’s channel programs. In our technology-driven world, products and solutions that can readily leverage technology and present a viable yet efficient functionality have a competitive advantage. Therefore, in order to meet their partners’ needs, vendors are constantly trying to outdo competitors by offering the most comprehensive web-based solutions through their partner portal software. Vendor: A business that produces products or provides services. Partner: A business that distributes or sells a vendor’s products. Customer: End-user of a product or service. A portal that isn’t routinely updated or littered with new valuable content, offers, and solutions, won’t have partners that consistently engage in partner activities—and the snowball effect of disengagement quickly follows. The power and functionality of your partner portal software are especially prevalent when looking to establish new partnerships. The decision to acquire new channel partners is a meticulous, slow-burning process. It requires the mechanics of your business to be flowing in a cohesive direction. For partners, on the other hand, choosing the right vendor who provides suitable services or products is an overwhelming task. No matter which side of the equation you belong to, the first step in finding a new channel partner is to make sure your goals and values are aligned. Basically, your partner portal software should offer and compliment a cost-effective way for your channel partners to access content, data, tools, and support that normally an account manager would provide. Since your partner portal software is designed based on the idea of informing and empowering your current and future channel partners, let’s take a look at what partners look for when shopping for a vendor. As much as you would like to think so, you are most likely not your channel partner’s only vendor. Always keep in mind, your current and potential partners work with many vendors, therefore, they need an efficient and comprehensible partner portal. Your partner portal software should give your channel partners secure yet partitioned access to the information they need to help you run your business. Your portal is not a place to boast about your success or yet used as a platform for advertisement. 80% of channel partners report complete dissatisfaction with their portal experience. Your channel partners should never feel out-of-the-loop because when they do, business goals fall apart, misinterpretation escalates and opportunities become scarce. Maintaining a prosperous partner relationship requires more than just direction, but dedication. To keep up with the ever-evolving culture of technology, vendors are frequently looking for the most innovative channel enablement tools to keep their existing channel partners empowered and satisfied as well as attract new partners. A successful vendor also keeps a diligent watch on the needs and wants of their partners to promote growth. Your partner portal software should furnish your partners with the necessary tools to achieve business growth. These channel enablement tools are to compliment your partner portal for potential partnership and revenue opportunities in the future as well as help everyone in your current channel ecosystem with generating revenue. As mentioned earlier, it is imperative that you and your channel partners are aligned and striving to reach a unified goal. A partner portal is merely a platform that facilitates the tools to help your channel ecosystem towards your goals and provides the means to hold members accountable for their actions. Offers more than one channel management solutions such as Co-op/MDF, Deal Registration, channel inventory management, ship and debit, etc..
As the channel evolves to keep up with the ever-changing cloud and subscription-based programs, vendors, partners, and consumers are all looking to employ solutions and services that help them work more efficiently with remote and instantaneous access capabilities. The gap between vendors that deploy subscription-based programs and data storage ‘virtual’ ecosystems—and those that don’t—is only widening. It’s a common fact that distributors and resellers are more likely to work with vendors that offer more innovative channel management services—viewing manual managerial processes as an archaic, counterintuitive business practice. If you are researching different partner portal software or looking to improve your current portal, explore specialized subscription-based business systems that will effectively help you administer all of your current channel processes! The average cost associated with IT infrastructure failure is $5,600 per minute. Computer Market Research (CMR) helps businesses maximize their relationship with partners and establish transparent, two-way communication that is built around one common goal: success. Our partner portal software provides companies with a standardized and streamlined way to register basic information, share business practices, create sales and marketing programs, audit and manage distributor claims, and more. A powerful platform for online collaboration, our portal was designed to add efficiency to you and your partners’ business. Your partners can access the latest related data including purchase orders (PO), delivery information and payment statuses at any time, anywhere. The rich, two-way collaboration enables partners to submit invoice requests while accelerating the way you process ship notices, review payments and update your partners’ information. — Chris Schultz, Senior Channel Marketing Manager, Plantronics, Inc.
Our cost-effective software streamlines channel activities reduce conflict and enable your channel partners to effectively market and sell your products. Most importantly, our solutions create real-time performance reports that make it easy to determine the return on your channel investments.